Five years ago I left Moncton, New Brunswick to pursue my doctoral studies in Montreal, and the last recipe I made in my old kitchen before leaving was a batch of bread-and-butter pickles. The only reason I remember this fact is that I had saved a jar for a friend, but had forgotten it at the office. So, one of the first phone calls I received with my new 514 number was from this friend who had had an awkward encounter with my former colleagues in order to rummage through their fridge for a jar of pickles. 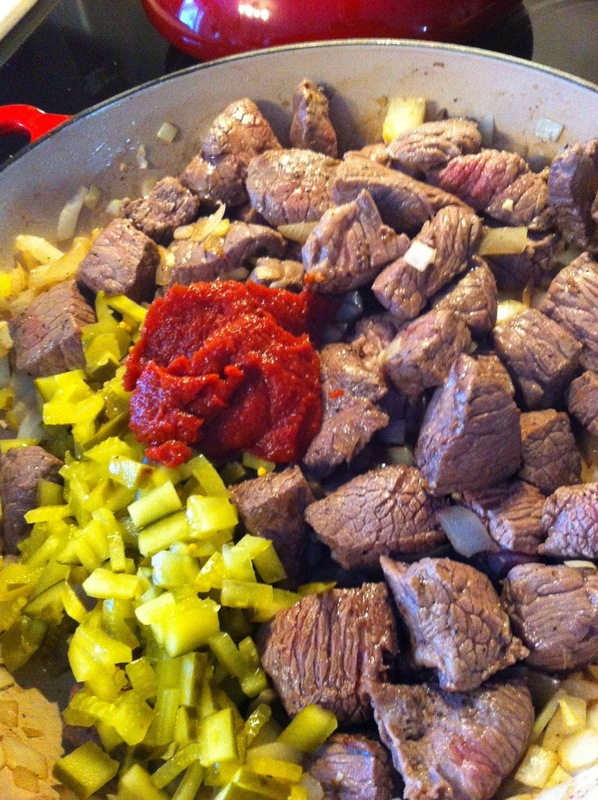 How appropriate is it then that five years later, as I settle back in town for the winter term, the first recipe I make is a beef and pickle stew for a dinner party ... held at the very same friend's house. My life came around full circle by preparing the Georgian-style solyanka, a sweet and sour soup, from the Book of Tasty and Healthy Food. As Kathleen points out in her introduction to the book, The Historical Cooking Project members should be relatively immune to the "nostalgic pull" of Soviet cuisine. She could not have predicted that the pickle would push and pull me through a bizarre time warp making my homecoming just as sweet and sour as the solyanka. Many varieties of this soup exist. The Book of Tasty and Healthy Food offers a meat, fish or vegetable version. Some modern recipes available online can be quite elaborate with ingredients including a blend of meats, spices, olives, capers, and lemon slices as garnish. The common denominator in all these solyankas, however, is the pickle. The Georgian-style soup that I made is quite simple, almost bare compared to others, but still very tasty. Its simplicity is key, making it a likely dish to whip up when there is little at our disposal. In a way, it can be a comforting soup, even on those bleak days of winter when few fresh ingredients are available. The instructions are very straight forward. 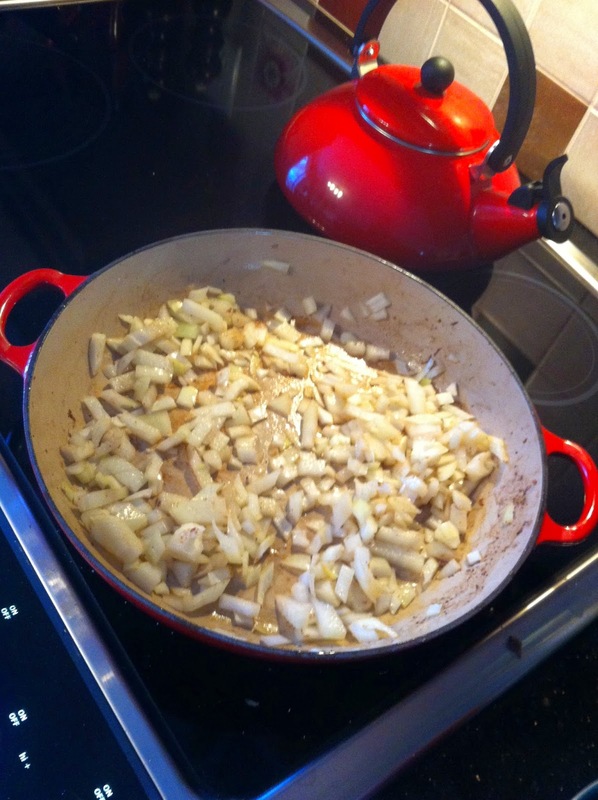 Then, fry up the diced onion. 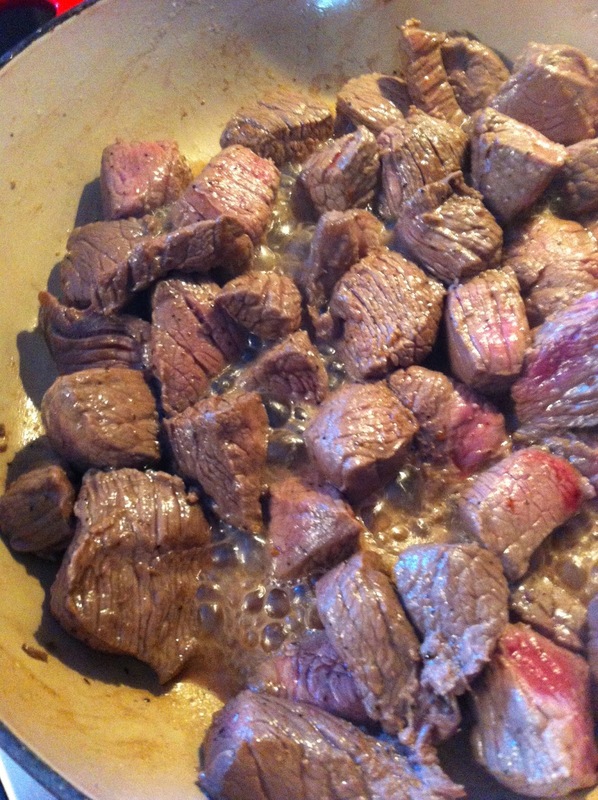 Return the meat to the pot, add all of the other ingredients and simmer for more or less 45 minutes. The recipe, like the others in this book, are meant to be simple in order to limit women's work in the kitchen. I was able to quickly finish the preparation of the solyanka and move on to other things like attempt to reconnect with this place I had left behind. Many things have changed. My parents have a new house. My friends have children. These kids are becoming tiny humans with their own (often times hilarious) thoughts, and I don't know what to do with them since the Crystal Palace amusement park shut down last year. But, many things still feel so familiar. I'm spending my days at my alma mater, walking through the same halls I did when I first entered academia. I'm having lunch in the same spot with the same people I ate with five years ago. The tables have moved and the walls have a fresh layer of paint, but I still know which chair to avoid if I don't want the sun in my eyes while I'm eating. Saturday morning, before making this soup, I went to the local market with my friend Lil, a routine we've kept up since high school and an outing I look forward to every time I'm in town. We still ask ourselves every time whether or not we should get some breakfast sandwiches when we both know the answer has always been and will always be the same - yes, of course. Sometimes, I forget that half a decade has passed. For just a second or two. It isn't eerie or confusing like déjà vu. It's not quite nostalgic either as there's no longing for the past. It feels like those moments on quiet days when you think you felt something shake or those nights when you hear a strange noise as you're drifting off to sleep - wait, what was that? Did the earth just move? Is there a stranger in my home? For a second, you sit still, listening - panicking - and when you see that there is nothing out of place, you let go and breathe out. It's an uneasiness that can't be relieved by clicking ruby slippers - that won't work here, Dorothy! I'm already home, and I left my shoes in Montreal. I'm not naive enough to believe that home wasn't going to change, and I'm not afraid of my hometown changing, but sometimes I'm scared that it is doing so without me. I want to witness its growth, and I want to be a part of the change. But, I've also changed by being away. I once told a senior faculty member in Montreal about my plans to return home after my degree. He said I wouldn't be able to - like a jar of pickles, once it is opened, it can't go back to what it was before. By leaving, I opened the jar, and by gaining so many new experiences, I became, like the solyanka, so much more than a pickle. To him, a solyanka can't find its place where a pickle once belonged, but I was determined to prove him wrong. I've been doing my best here, but these moments of panic may in fact be moments of doubt that I can or want to fit in. What if Moncton and I are growing apart ? What if from now on, we only meet as ex-lovers who barely recognize each other? I knew my friends liked pickles, but I didn't know how they would feel about solyanka. When I told them I was making the stew, they didn't quite know how to react. "There are pickles in it! ", I told them. What a perfectly good way to ruin a stew. What a perfectly good way to ruin a pickle. But, to their surprise and to my relief, they enjoyed the solyanka. They even asked for the recipe.